The National Bank of Uzbekistan (NBU) and the French bank Natixis signed two agreements worth 500 million euros, Podrobno.uz reported. The document was signed on October 5 in Paris within the Uzbek-French business forum. 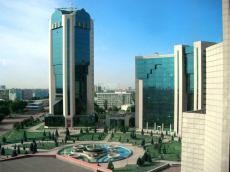 "The agreements envisage the expansion of cooperation in financing big investment projects, as well as small and medium-sized business projects envisaging the import of high-tech equipment and services from France and other EU countries," the Uzbek bank said. The projects are planned to be implemented in the field of export financing, rendering assistance in entering European capital markets, as well as issuing loans for the implementation of strategic projects within the reached agreements. The cooperation with Natixis bank will give a new impetus to the development of trade and economic relations between the two countries, allow attracting long-term loans on favourable conditions and create new investment opportunities for business in Uzbekistan. Natixis is one of the biggest French corporate and investment banks. It is part of the BPCE Group and is the fourth biggest bank in France. NBU and French bank Crédit Agricole signed a loan agreement worth 300 million euros within the business forum.